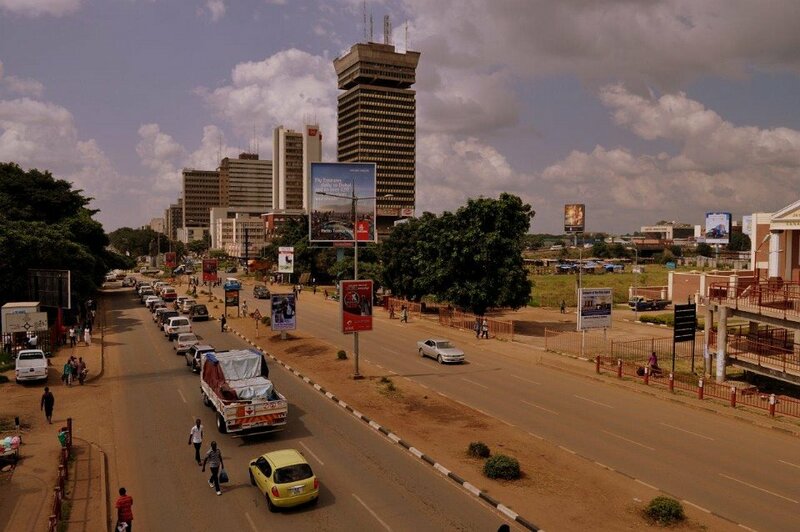 usaka has become something of a boom town of late. New buildings are going up everywhere and many chain stores and shopping malls are springing up all over the sprawling suburbs. The markets are a hive of activity as the thousands of stalls are set up, upgraded and cleared away every day. A myriad of motor spares dealers, restaurants, hairdressers, fishmongers, fruitsellers and rows and rows of “salaula” – stalls of discarded clothing from the West sold to Africa by the bale. 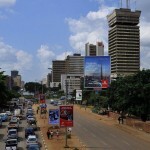 The capital covers an area of over 70km2 and is one of the fastest-growing cities in central Africa. It’s population almost trebled in the immediate post-independence era and continues to grow daily. There has been no influx control and the city is bursting at the seams. Grossly inadequate municipal facilities are hard-pressed to cope with the ever-increasing demand. 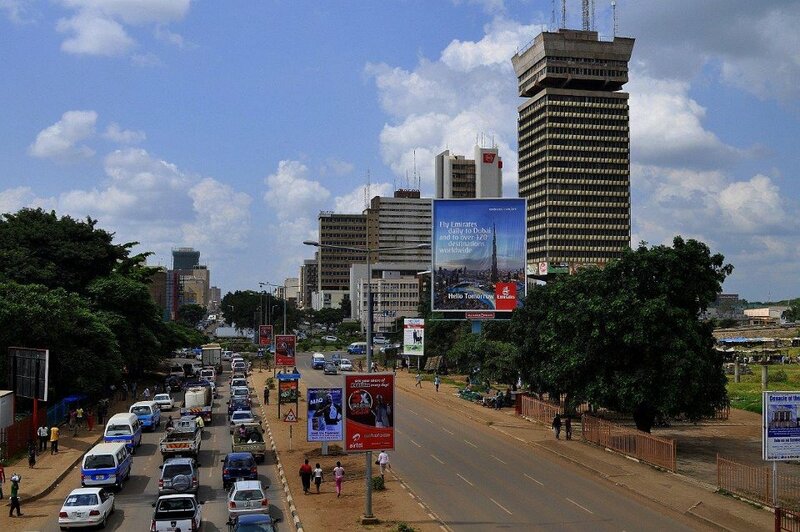 It is a sprawling, metropolis with many multi-storey buildings, high-walled suburbs and busy shanty towns. Development has brought together people of many nationalities, making it a bustling centre for economic, political and cultural activities. The city lies at the junction of the main highways to the north, east, south and west, and at an altitude of 1300 metres above sea level. 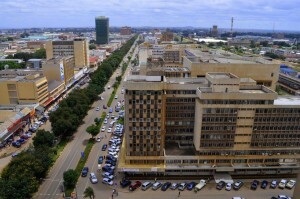 There are air links to most of the major tourist destinations in Zambia from Lusaka International Airport. There are no scheduled bus services – the blue taxis range from 12 seater minibuses, to dilapidated cars, to good dial-up cabs, to chauffeur-driven vehicles for hire. There are many good restaurants in Lusaka including coffee shops, take aways, night clubs, pubs as well as their phone numbers. 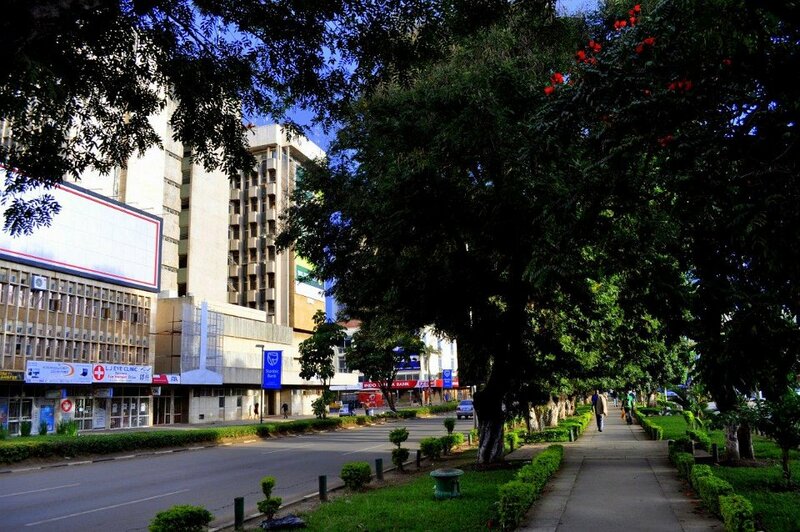 The most appealing factor to many who have made Lusaka their home is the superb climate - warm sunny summers, interspersed with cooling thunderstorms and mild winters with loads of sunshine. It can get very hot between October and March if there’s no rain. The average rainfall, between November and April, is about 950mm. Summer temperatures range from 20 degrees to 32 degrees C. Winter temperatures from 10 degrees to about 26 degrees. Humidity is usually below 40%. 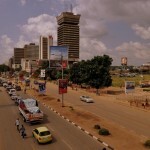 Lusaka is close to the centre of Zambia between the eastern and western bulges. All major routes to the east, west, north and south flow through the city. The Great North Road comes down from Tanzania via Kapiri Mposhi, and is about 1100km from the Tanzanian border. The Great East Road from Chipata to Lusaka is 570km. The road from Livingstone in the south meets up with the Kafue Road and is 470km long. From the Chirundu border with Zimbabwe, the route is well paved and 136km long. The Mongu road coming in from the west via the Kafue National Park is 591km long. The domestic railway goes to Livingstone, Kapiri Mposhi and the Copperbelt. The Tanzania Zambia Railway - Tazara - comes down as far as Kapiri Mposhi, where the Zambia Railways train links it to Lusaka. Buses arrive from Harare, Lilongwe, Johannesburg, Livingstone and the Copperbelt. Lusaka International Airport, which is 14km from the city centre, receives most international flights. 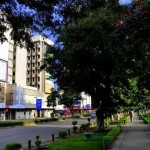 Most of the banks and many bureaux de change can be found along Cairo Road. 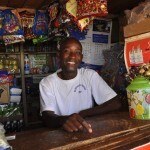 For groceries and general supplies there are several shopping malls, two along the Great East Road, two on the Kafue Road south of the city and out out towards Leopards Hill. There are several suburban shopping centres, not of the mall type, but with a variety of shops that usually supply anything you need, mostly imported from Zimbabwe or South Africa and a little pricey. These are called Kabulonga, Northmead and Woodlands. 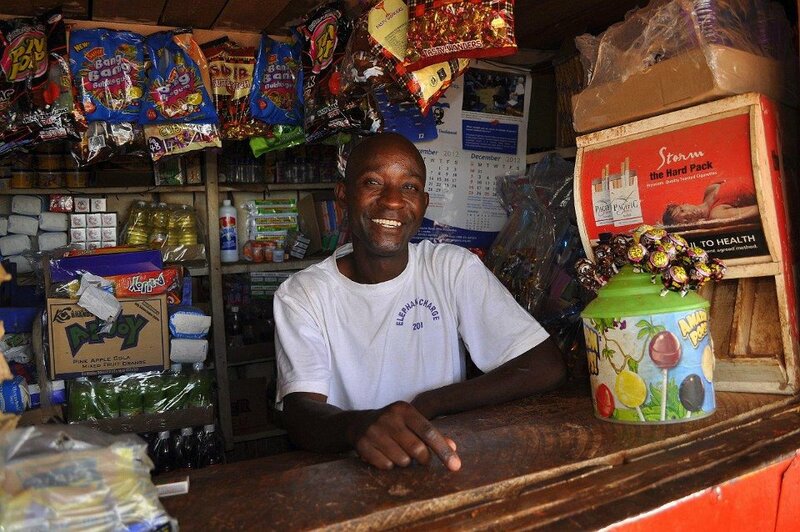 If not for shopping, but just for the experience of how the local masses shop, a visit to one of Lusaka’s markets is a must. It’s an interesting experience and well worth a visit for the colourful and lively atmosphere. The Soweto Market is two roads west of Cairo Road, and the other opposite the Tazara building in Independence Ave. A new, smarter, roofed market has just been built along Freedom Way. 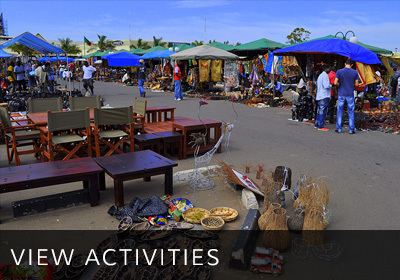 Curios and crafts can be found at Kabwata Cultural Village, Sunday craft market at Arcades Shopping centre, Kubu Crafts at Manda Hill shopping centre, and Abbabas House off Addis Ababa Drive. Moore Pottery on Kabalenga Road has an excellent range of ceramics, and every last Saturday of the month there is an excellent craft market in Kabulonga suburb at the Dutch Reform Church grounds. For gemstones and fine jewellery, try Jagoda at the Holiday Inn or the Intercontinental Hotel. A word of warning - Lusaka is famous for car thieves, pick-pockets and bag snatchers, but if you have someone who can mind your vehicle and keep a good grip on your bags, it is quite safe. There are several sports clubs in Lusaka which offer facilities for golf, tennis, swimming and squash. For golfers, there’s the Lusaka Golf Club, Chilanga Golf Club and Chainama Hills Golf Club. The Lusaka Club offers bowls, tennis and squash. Polo is a popular sport, especially among expatriates, and the polo field at the showgrounds usually has matches on the weekends. Hash House Harriers organise walks and runs on Saturdays at 15h00. Several swimming pools are available. The large Lusaka City Council swimming pool just off Lubu Road is open every day except Mondays from 10h00 to 18h00. One can also use the pools at the Intercontinental and Pamodzi hotels at modest prices. The Mulungushi Hall is the main hall in town and can accommodate up to 2000. Four other committee rooms can take from 40 to 200 people. There is a simultaneous translation service and proceedings can be transmitted on closed-circuit television. 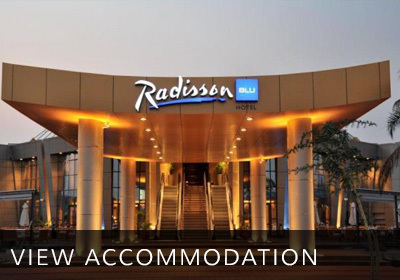 The Inter-Continental Hotel, Pamodzi, Tsogo Sun, Lilayi Lodge, Chaminuka Private Game Reserve , Ndeke Hotel and Hillview Hotel also have full conference and banqueting facilities. Most smaller hotels also have conference facilities. Dream Valley is in the suburbs and has great pools to swim in and a thatched conference venue. The National Museum is also worth a visit, with a collection of contemporary Zambian paintings and sculpture as well as a more archaeological and ethnographical section upstairs that fills visitors in on some of Zambia’s fascinating cultural history. For a spot of suburban safari, Lusaka now has a National Park on the outskirts of the city. You’ll find it along the Leopards Hill Road. There’s a high viewing platform or several roads to take a drive and see several species of antelope. Kalimba Reptile Park is a bit of a trek from town and only accessible with a 4x4, but it’s a great place to view crocodiles and snakes and then grab a beer and a crocodile sandwich!